Thirty people gathered at the the Rivendell Theatre in Edgewater on Saturday morning to discuss the treatments currently being added to a short stretch of Glenwood Avenue to create a pedestrian- and bike-friendly “neighborhood greenway.” These changes include a new contraflow bike lane and signage that will calm traffic and facilitate two-way bike traffic on this mostly one-way northbound stretch of Glenwood Between Carmen Avenue and Ridge Avenue. Scanning the small crowd before the community meeting, I couldn’t help noting who had a bike helmet with them and who didn’t. Would the meeting have an us-versus-them feeling? Or was I preemptively denying each attendee’s individuality by mentally sorting them as cyclists or motorists before the meeting even started? The meeting kicked off with a presentation by 48th Ward alderman, Harry Osterman. He began by describing Chicago as undergoing a “learning period,” as more people start riding bicycles in its streets. During the learning period, Osterman said, both people on bikes and people driving will need to learn how to coexist safely. He talked about wanting to bring together a working group, including people who bike and/or drive in the ward, to talk about sharing the streets. 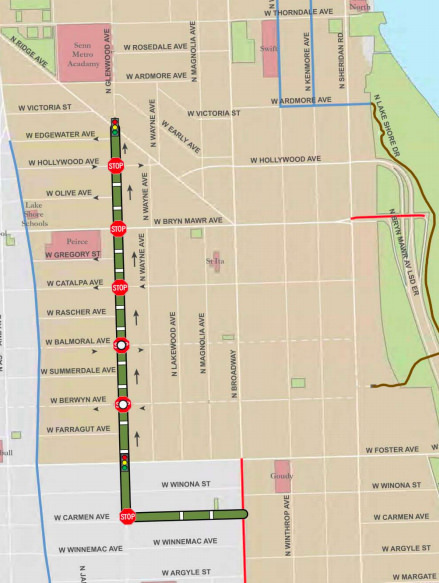 The alderman explained that the one-way-northbound stretch of Glenwood between Foster Avenue and Ridge, about two-thirds of a mile, is already being used by southbound cyclists, including students biking home from Senn High School. He said that he understood how parking — especially parking removal — was a sensitive topic for the motorists in the room. Osterman went over the Glenwood route spot by spot, explaining how the changes would result in a net loss of exactly two parking spots. The route of the Glenwood Avenue neighborhood greenway. Click to enlarge. When he finished speaking, the group had questions. Only a few of the people who spoke talked about the specifics of the proposed infrastructure improvements. One woman asked if the bike lane will make her liable if she hit a cyclist. Osterman replied that the lane would not affect liability. A man suggested the lane be built on Wayne Avenue, a wider street, instead of Glenwood. However, most of the comments weren’t about the specifics of the greenway. People wanted to talk about the general issues of speed, courtesy, and sharing the streets. In particular, as the comments began, expressed concerns from a driver’s perspective. An elderly gentleman talked about an experience he had before he retired from driving. He described a close call during which several cyclists sped through an intersection. As a person who bikes, I appreciated hearing his point of view. I hadn’t thought much about how older drivers might have a hard time reacting to cyclists on the road, although thinking about that made me equal parts sympathetic and nervous. One woman said she wanted to be nice to bike riders by thanking them when they stop at intersections, but added that she almost never sees them stop. This set off chuckles among some of the attendees. Of course, as recent local video has shown, it’s also very common — and much more dangerous — for people to blow through intersections while driving. After the meeting Justin Haugens, a Rogers Park resident (and occasional Streetsblog freelancer) who often bikes through Edgewater, told me he was frustrated by what he heard. Haugens felt people were making inaccurate statements about the behavior of bike riders. For example, someone claimed that people regularly travel as fast as 30 mph while riding down side streets like Glenwood. “A driver’s perception of a biker’s speed is inaccurate,” he said. During the community meeting, Haugens had shared his point of view with obvious emotion in his voice. He described what it felt to ride a bicycle while sharing the street with thousands of pounds of fast-moving metal. The other attendees listened quietly and respectfully. I wondered if hearing this would change drivers’ attitudes or behavior. “The remarks I made intended to humanize my experience while addressing their experience,” Haugens said. Watching the residents listen intently to his story made me think that the alderman’s idea of creating working groups of residents to talk through these issues might have value. Osterman discussed Sheridan Road in the ward as an example of a place where conflicts between pedestrians, bicyclists, and drivers have been an issue. This stretch of Sheridan is a high-speed four-lane, basically an extension of Lake Shore Drive, so it’s not a safe place to bike, but there are many residences and retail destinations on the street. After neighbors, especially seniors, voiced concerns about being struck by bike riders on the sidewalk, an ordinance was passed to make sidewalk biking on this stretch punishable by a $250 fine – almost three times the $90 minimum penalty for driving on the sidewalk. “We’ve done enough with tickets being written and yelling at people,” the alderman noted. Haugens thinks that the cyclist and motorist working group in in Edgewater may be a good idea. “It wouldn’t hurt,” he said, adding that the best way for people who drive to gain perspective on the issues faced by Chicago cyclists would be for them to try biking on city streets themselves. Two days later while walking on Glenwood, I spotted a woman biking south. I asked if she knew that a southbound bike lane would be installed on the street. She didn’t, but was happy to hear it. “That’s great!” she shouted. She said that she regularly bikes south on Glenwood to pick her daughter up from kindergarten. The contraflow bike lane will legalize cyclist behavior that is already common, while making bike riders more visible to drivers. Hopefully the winter working groups will help ward residents gain some empathy for other road users, and will lead to some progress towards street safety come springtime. What will come of the speed bumps all over Glenwood? They make it more difficult to bicycle, especially if you’re carrying anything on your bike. I’m glad Alder Osterman is moving forward with this. I was afraid he would let it slide off the radar. On the other hand he either caved or is pandering on the Sheridan sidewalk issue. Raising the fine will do nothing as the culprits are the ignorant who won’t even know the fine amount. That so many do it shows poor design and/or great unmet need. In my humble opinion Edgewater suffers exceptionally from car abuse. Lake Shore Drive ends/begins smack in the middle of us. Between the lake on one edge, cemeteries on another, and a convergence of arterials all contribute to an historic over design for and over use by car traffic in an again exceptionally dense neighborhood. Drivers accept congestion in a true downtown but Edgewater feels and looks more like a suburb where drivers expect speed. And while we have great transit infrastructure it like the streets are designed for passers-thru rather than local use. For example there are plenty of shoppers on the east of the neighborhood and a great pedestrian zone for shopping in Andersonville on the west but there is a dearth of transit between them. A similar dynamic exists biking-wise. One would expect the Sheridan Road high rise density would support strong Divvy usage. But there are few stations there. It is even possible that the same forces that struggle against bikes on the sidewalks there have quietly resisted more Divvy there as well. I don’t know so please take that statement with a grain of salt. But it is also true that there exists little east/west bicycle infrastructure as well. I personally have proposed a special bike/pedestrian zone for Granville between the lake and Ridge to the west. Two grade schools, two churches and a mosque in a three block stretch cry out for it. Indeed there appear to my eye to be more bikes using that stretch of Granville than the stripped bike lane on Devon two blocks north. Edgewater presents a huge opportunity for more traffic calming and improved bike and pedestrian infrastructure. Nothing was said about that in this meeting. In the community meeting on this subject more than a year ago, it was suggested that some or all of the speed bumps on the affected blocks would be updated to the ‘sinusoidal’ type. That would be great. The drawings showed that the bumps would be painted on both sides. Currently they are only painted on the side facing traffic. The solution would be to slow down to the appropriate speed, just like cars do when approaching a speedbump. Yeah you have to but the way they’re “attached” to the street is such that there’s huge gaping holes in spots. Plus, the impact of a speed bump on the contents of a bicycle is much different from that of a car, so speed bumps on bicycle streets should be designed with that in mind. I ride Fulton west out of the City a lot with a loaded bicycle. There are stretches with several speed bumps, and stretches without. Guess which stretch has cars routinely treating it like a race track? I’m all ears for alternative measures (though increased enforcement seems likely never to happen as the most obvious one), but until then I’ll gladly unweight my back wheel and deal with the bumps. I hear you that they need to be installed right and maintained, but right now I think they serve a pretty vital function. Agreed. I have to deal with speed humps on my favorite route to/from my neighborhood grocery store. The leading edge of most humps is NOT bike friendly – too abrupt an edge, resulting on a sharp jolt, as well as increased vulnerability to snow plow damage in winter. I hate having to report pothole requests for craters in speed humps because the humps were poorly installed. Ride Hinman Avenue in Evanston for a MUCH better example of how to do speed humps in a bike friendly way – one that’s much better for riders, groceries, kids, etc. Kinda: There is a major difference in that cars have 4 wheels and a suspension. I strongly agree Jeff! I think your point about E-W bike infrastructure in the neighborhood is particularly well taken. Hi Shaun! To my recollection, the speed bumps on Glenwood specifically weren’t mentioned. But as I remember it, the alderman did mention the neighborhood’s speed bumps in general, with the gist being that they are good and slow down car traffic. Personally, as a cyclist in the area, I don’t have a big problem with the speed bumps. I went over a whole bunch of them just now on Kenmore and they didn’t bother me. There’s a speed hump design that is “friendly” to bicyclists in that it doesn’t have a jarring effect when you go over it, and it doesn’t slow you down. But CDOT won’t use it. Evanston did an excellent job where they’ve used them. Their speed humps have smoother leading and trailing edges. Try riding Hinman sometime, from Main St. north to downtown to experience a better kind of speed hump. On Glenwood, I hate them as installed because they are too jarring. I have the same complaint pretty much anywhere in the city. The harsh leading edge also makes CDOT’s default design vulnerable to snowplow damage, which invites potholes in the speed humps, adding insult to injury. The route would run from the Chicago River to Western Avenue.